IF YOU SERVED IN THE UNITED STATES MILITARY DURING CERTAIN "ELLIGIBLITY DATES", THEN YOU CAN JOIN THE AMERICAN LEGION. YOU NEED TO SEND A COPY OF YOUR DISCHARGE PAPERS (DD-214) WITH A COMPLETED AMERICAN LEGION MEMBERSHIP FORM. YOUR DISCHARGE CAN BE HONORABLE OR GENERAL UNDER HONORABLE CONDITIONS. Welcome to the Smith-Warren Post 367 web site. We are devoted to veterans in our community of Scottsville, NY. We provide a meeting place for our American Legion members and their families. Our organization consists of Legion, Auxiliary, and Sons of the American Legion (SAL). Our Post Home has a large meeting hall, Club, commercial kitchen, a large room in the upper level which is often rented to local businesses, two offices and storage area. We rent our meeting hall to our members and the community for parties, weddings, baby or wedding showers, and reunions. Gatherings after funerals are at no charge to the family. Call the Club Manager to book. This site in memory of Ernie Swingle, Don Walters, Bill Steimer, Paul Streb, Robert Chan Sr, Keven Vandyke and Jack Oblen. All lost in 2016. 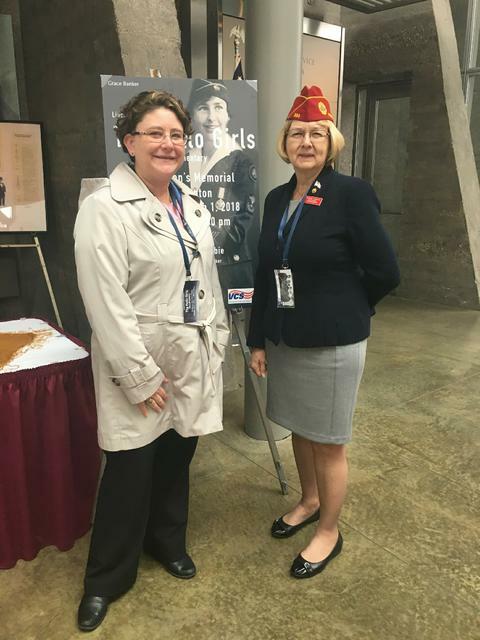 National Commander Denise H. Rohan and Fellow Legionaire Jennifer Minus Daughter of Past Post & past County President Liz Streb. Boot Camp for VETS thru Syracuse University. Please pay your 2019 dues by December 31. If you have already paid, Thank You.